Cofely Fabricom NV/SA (GDFSuez) has utilized Campbell Scientific equipment on numerous projects in both the public and private sectors. Campbell Scientific equipment was selected because its technology is well proven in data acquisition applications and because it offers system flexibility, enabling the simple integration of "best of breed" third-party sensors. The Coastal Division of the Agency for Maritime and Coastal Services, part of the Flemish Ministry of Mobility and Public Works, required an update to an existing acquisition system and employed Cofely Fabricom to undertake the task. 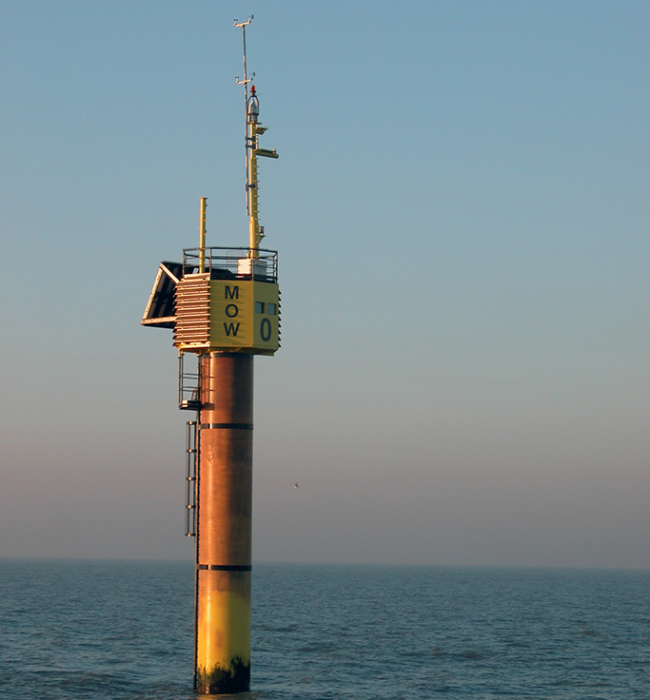 The current system, based on a Campbell Scientific CR23X datalogger, had been in use for many years measuring piles along the Flemish coast. However, the client wished to bring the system up-to-date using the latest Campbell Scientific data acquisition platform. Several sensors had to be interfaced, including some of Campbell Scientific manufacture and some third-party devices. The solution, engineered by Cofely Fabricom in cooperation with Campbell Scientific in the UK, was based on a CR3000 and CR1000 connected in a network. Because the measurement locations were at sea without a wired connection to the mainland, a redundant GPRS solution was chosen for data communication. Two different service providers were chosen to avoid dependence upon a single network. Using and controlling two GPRS modems to ensure that all the data is collected in the event of failure of one of the GPRS connections, and without any risk of overwriting data when switching between the two GPRS connections, was a tricky problem to overcome. The solution involved using the two dataloggers in a PakBus network, with each datalogger controlling one GPRS system. Using two dataloggers additionally resulted in a better distribution of the sensors and measurement parameters across the system, reducing the workload required of each datalogger. The CR3000 datalogger is used for fast analog measurements and several RS-232 and RS-485 third-party sensors using 6 SDM-SIO1 serial input/output modules. The CR3000 is also used to control an SDM-SW8A 8-Channel Switch Closure Input Module and two SDM-CD16AC AC/DC Relay Controllers for remote power switching of the sensors. The second datalogger, a CR1000, measures some slow analog sensors, 2 SDI-12 sensors and 2 slow RS-232 sensors. Data is exchanged between the two dataloggers by utilizing two MD485 RS-485 multi-drop interfaces. Both dataloggers run a “slow sequence” routine that monitors the availability of its GPRS link, and restarts the modem if the communication link has gone down. Onshore, data is collected and stored on a server running Campbell Scientific LoggerNetAdmin. Cofely Fabricom used the LoggerNet Server SDK to develop an in-house program that they call “LoggerNetRedunCheck,” which continuously monitors the communication status of all the communication links. If a connection fails, LoggerNetRedunCheck switches the connection from one communication channel (master) to the other (slave) with only a few commands. As soon as the major connection is available again, the routing is switched back. The LoggerNetRedunCheck application monitors all this on the basis of the LoggerNetAdmin configuration. By checking the names (IPPort, PakBusPort, Dataloggername), there are no additional settings and configurations necessary for this application. This ensures simple operation. When communications are switched there is no loss of data, and previously collected data is not transferred again.